Set of 5, Scott 42-46, MNH. The two flag stamps were also issued with the overprint in imperforate format. The perforated versions exist with inverted overprints. The souvenir sheet issued with the original flag stamp issue was not issued with this overprint. One value with the flower motif exists with the overprint only partially on the stamp. See the Errors & Varieties pages. This set was prepared in India (Nasik Security Press) as an emergency measure while the 1966 Simtokha Dzong definitive set of 3 was being prepared. 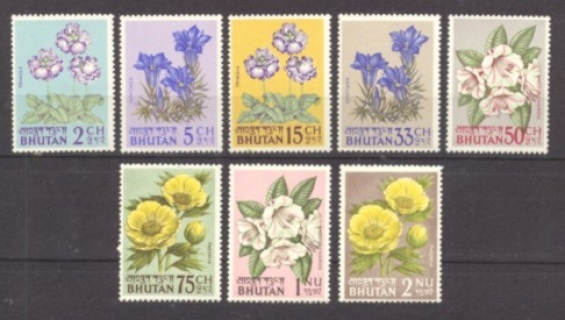 The "emergency" surfaced, because the previous Bhutan Stamp Agency issues it prepared did not include sufficient quantities of letter-rate stamps. 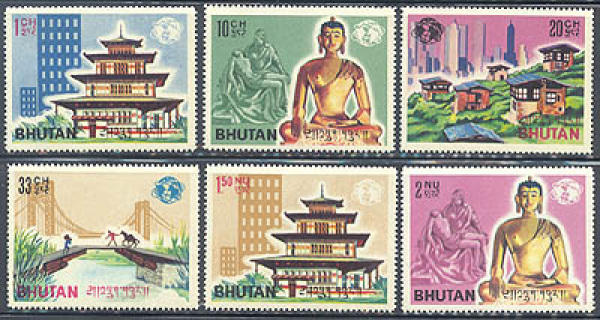 1965-6 was a period when many Bhutanese post offices were being opened, and the postal service was expanding quickly with Indian assistance. This is the scarcest of Bhutanese issues. Only three copies of the 5ch values on World Refugee Year pair are known on cover. Two or three contemporaneously cancelled copes off of covers are known. The other values are known on cover in larger quantities (a couple of dozen, perhaps). The stamps were not announced in advance to the philatelic press and were not generally made available to collectors. Printing quantities are as follows: 68: xxxxxxx; 69: xxxxxx; 70: xxxxxx; 71: xxxxxx; 72: xxxxxx; 73: xxxxxx; 74: xxxxxx; 75: xxxxxx. (Source: Nasik Security Press records.) No official FDCs were prepared. Fake FDCs exist in the market (illustrated in the Postal History pages). For illustrations of covers cancelled on dates of earliest known usage, see Postal History pages. Two settings of the 5ch surcharge are known. See illustration in Errors & Varieties page. The second setting is believed to be a printer's sample and not an issued stamp. 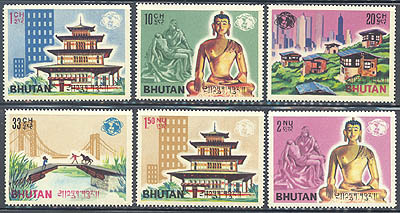 Some single copies of stamps from the set are available. Prices on request. Values from this set were extensively surcharged and overprinted. 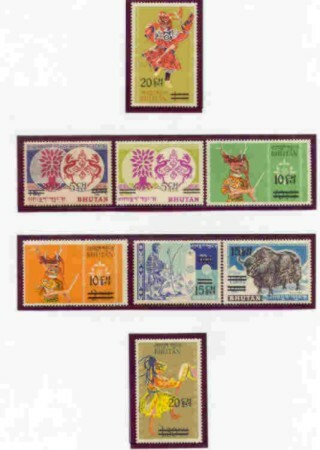 The set and souvenir sheet were also issued in imperforate format. 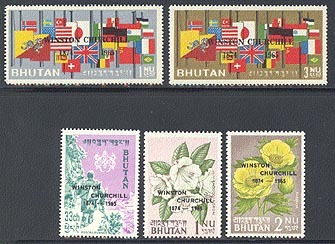 Two values of this set were issued in a souvenir sheet. Stamps removed from the souvenir sheet are perforated 13.5, and can be distinguished from the sheet stamps which are perforated 14.5. Stamps from the imperforate sheets cannot be distinguished from imperforate stamps removed from the imperforate souvenir sheet.